This festival falls on the 8th month, 15th day of the Chinese Lunar Calendar, making it on the 18th September for 2005 around the time of the Autumn Equinox. In the Western calendar, this festival normally falls between the 2nd week of September and the 2nd week of October. 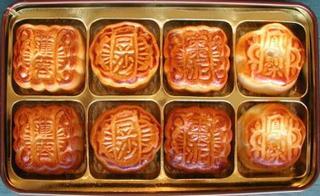 The Mooncake Festival or Lantern Festival or Mid-Autumn Festival , call it what you will - is a celebration of unity. This festival is believed to have originated from the ancient ceremony of Sacrificing to the Moon Goddess for the year's end harvest. This is when families return to celebrate and give thanks for the year's bounty. Offerings of their harvest such as apples, pears, peaches, grapes, pomegranates , melons, oranges and pomelos were common. Other offerings cooked, baked etc included moon cakes, cooked taro, and water caltrope, a type of water chestnut resembling black buffalo horns. And of course, 'tang yuen' made from glutinous rice. 'Yuen' means 'round' which symbolize "completeness" as in "yuen man" of the cycle. Thus, it means unity and harmony within the family. The Mid-Autumn Festival is a traditional festivity for both the Han and minority nationalities. The custom of worshipping the moon can be traced back as far as the Xia and Shang Dynasties (2000B.C.-1066B.C.). In the Zhou Dynasty(1066B.C.-221B.C. ), villagers held ceremonies in preparation for the arrival of winter and to celebrate the beauty of the new moon. In the later dynasties, mooncakes were baked and sent to relatives as gifts of family reunion.Traditionally, thirteen moon cakes were stacked into a pyramid to symbolise the thirteen moons of a "complete year," that is, twelve moons plus one intercalary moon. During the Yuan dynasty (A.D. 1280-1368) China was ruled by the Mongolians. Rebel leaders unhappy with the overlords, plotted to overthrow the government. As the Mid-Autumn Festival drew near, the rebels ordered cakes baked and distributed to the villages. Messages of the outline of the attack were baked into the cakes. On the night of the Festival, the rebels with the help of local villagers, successfully overthrew the government and later established the Ming dynasty (1368-1644 A.D.). Hence from then on, the Mooncake Festival is celebrated on a large scale. My Malaysian friends, who visited me recently, brought me some mooncakes which they had bought in San Francisco. They told me those were actually replacements for mooncakes which two sisters in Malaysia had sent me through them. :-( Apparently the mooncakes they brought from Malaysia were confiscated by a custom official at the port of entry. Why? Because the mooncakes contained egg yolk! Grrr! What? Were they afraid that bird flu virus might have been in the egg? Give me a break! There are tons of mooncake imported from China available right here in our oriental stores! It just makes you wonder about the intelligence of the people who are supposed to guard our borders!